Oh hey, it’s another comic published under the ChuChu Comics label! This cover has cute boys and chocolate, so I really could not resist it. (As if I need an excuse to buy more manga!) The orange and red colors give this book a warm feel, and I like the heroine’s expression. This is a cute one-shot book (then again, every series I talk about on this site is cute!) that has really nice art and fun characters. This main story takes up the entire book. Aside from the art, I like the fact that for a while I couldn’t decide who the heroine would end up with. Usually, it is painfully obvious right away who she will find true love with, but in this case, I wavered a bit and couldn’t decide. There is a point where it becomes clear, but for the most part, I was undecided. I like both guys! 🙂 This book is by the same author as another title I have talked about on this site, Royal Green and like that story, this one is not smutty, and is aimed at a reader that is older than something from, say, Ribon Magazine, but younger than the teen audience of Sho-Comi. Nothing smutty in here at all, it is simply cute fun. 14 year-old Seri is a sweet, fun, girl. 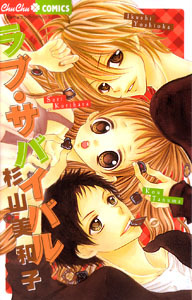 For the past… oh… FOREVER, she has had a crush on her childhood friend and next-door neighbor Kou-chan. Even though her heart pounds when she sees him, and her face turns red, Seri does everything she can to be near him. Kou is an outgoing, friendly guy with dark spiky hair and a slightly clueless air about him. It’s not that he is dumb, but I wonder at his observational skills, because it is so painfully obvious that Seri likes him. However, Kou treats Seri like a kid sister. He cares about her and feels protective of her, but it doesn’t seem like he feels for her in a romantic way. In fact, even though he doesn’t have a girlfriend, there is someone else that Kou likes. Seri is aware of this, so she doesn’t dare confess her own feelings to Kou. Instead, she keeps quiet and suffers through her unrequited love. As for the person Kou likes? Well, unfortunately for Seri, it is her big sister, Nana! It is hard to believe that Kou can actually like Nana, because she is not exactly the nicest person out there. In fact, she has a rather selfish and sadistic personality. Nana is older than both Seri and Kou, she is beautiful, and she is bossy. Kou must have a masochistic side, because he still seems to like Nana, even when she treats him bad. For years, Seri has known that Kou likes Nana. It is painful, but she has coped with it because she knows that Kou’s own love is a lot like her own — unrequited and un-confessed. But Nana’s birthday is coming up, and Kou tells Seri some startling news — he is finally going to confess to Nana! Oh no, how awful! This makes Seri extremely depressed. However, she DOES have one person she can talk to about her situation. His name is Ikushi, and he is a classmate of Seri’s. Ikushi is cute, but he has a bit of a vain personality. He is the type that deliberately sparkles, and uses cheesy lines on girls when asking them out. She can’t believe it when she hears that Ikushi has actually been cheering Kou on, encouraging him to confess! Still, he is the only person who listens with a sympathetic ear to Seri’s love problems. But wait… when Ikushi finally meets Nana, she completely rejects his bad pickup line and shoves him away. Wouldn’t you know it? This cool reaction actually grabs Ikushi’s interest, and he falls for Nana too! Poor Seri, both guys in her life are stolen away by her sister? Will she ever get up the nerve to confess to Kou? Or will she turn Ikushi away from Nana instead? As I said before, I liked this one because for a while I wasn’t sure how it would turn out. I could see Seri with either guy, as she does have really nice moments with them both. I almost wish there were more volumes of this, because I think there could be more done with the characters. At any rate, this is a book I recommend if you are looking for a quick, easy, read.